Arsenal make approach for Barcelona attacker? 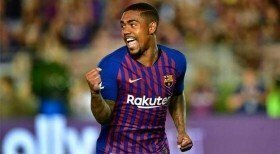 Arsenal have reportedly made an approach to sign Malcom from Barcelona on an initial loan agreement. The Brazilian only joined the Blaugrana during the summer but he has since struggled for gametime with just the solitary start in La Liga. According to The Sun, the Gunners have made a loan approach for the former Bordeaux man, who has largely featured in the Cup competition for the Blaugrana this term. It is added that the north London side could be prepared to pay as much as £50m to turn the deal into a permanent one in the summer and that could be one of the determining factors in convincing the Blaugrana into a deal this month. Malcom was previously on the Gunners radar 12 months ago but during that period, ex-club Bordeaux were reluctant to sell the Brazilian after giving assurance to manager Gus Poyet, who has since been sacked from the head coach position.